New Roof, Roof Replacement, Roof Repair, Roof Cleaning, Gutters, Windows, etc. 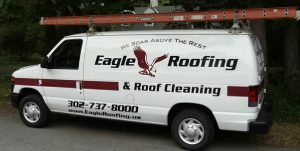 how can eagle roofing help you? We stand by our word—the price you've been quoted is the price you'll pay! 70% of our business is from repeat customers and referrals. We keep our customers happy, and they keep coming back. We offer free written estimates and we stand by our word—the price you’ve been quoted is the price you’ll pay! "We love the roof. I was very impressed by your crew. Fast, efficient, and kind. They cleaned up better than I thought it could be. Thanks for a great job!" "Thanks for all that you and "Eagle Roofing" did. It was a great job and several residents have stopped by to say how impressed they were with the speed and appearance of the job. Dorene says to tell the young boy that did the cleanup of nails and scraps that he is a great worker." "The guys did a great job. The roof looks great. They cut in all the additional vents as requested and left the site clean. I'm 100% satisfied with the outcome. I was a little worried when selecting a roofing company because I have heard horror stories but your company did an excellent job and I will highly recommend you to friends and family. Thank you for being an excellent contractor." Debbie and Kevin……thanks again for you and all of your troops for handling the roof issue. Clearly it was more involved than we anticipated. A special thanks to your on-site crew as they were very professional and customer focused. Debbie, you and your helpers are the ones who deserve the thanks. I am totally satisfied with my new roof. You were here for me all the way and I do appreciate your help. Your crew arrived on schedule, started to work immediately and cleaned up when they finished the job. I could not believe how quickly the job was completed.I found no roofing nails anywhere on or around my property...not like some of the other roofers who have come into this neighborhood to do roofing job. I am more than happy to recommend you to family, friends and neighbors. Best of luck with your business and thank all the crew for me. Debbie - thanks so much for your follow up. I am delighted with the work Jordan did...it just rained the other day, and it was amazing not to hear water sloshing over my balcony - my new gutters rock!!! I took pictures and emailed them to my friends with your phone number. 🙂 Thanks so much!!! Everything went very well, yes; and we appreciate how quickly everything was taken care of as well! Please let Jordan know we said "thank you" again, he was a pleasure to work with. We've been put through the ringer over the past few months dealing with contractors for quite a number of projects around the house, and you guys were certainly the most professional and responsible; we'll be recommending you for sure. Thank you again. Eagle Roofing is the best from the office staff (Debbie) to Kevin. The roofers were very nice and cleaned up great. A 10 star company. Customer of NCC Repair Program! Many thanks for your excellent job on the chimney work. Your color photos show the work very well. We very much appreciate your expedient, good job with all of the uncertain weather! The guys did a great job. The roof looks great. They cut in all the additional vents as requested and left the site clean. I'm 100% satisfied with the outcome. I was a little worried when selecting a roofing company because I have heard horror stories but your company did an excellent job and I will highly recommend you to friends and family. Thank you for being an excellent contractor. Thank you for helping me out and thank your men. I was really pleased with the job they did and the speed in which they finished. They did an excellent job cleaning up! Not only is the roof AMAZING, but your compassion and consideration in handling this job surpasses any expectations. The human touch in business isn't dead yet! I appreciate you guys getting to this so quickly and for such a reasonable price. We'll definitely call you guys next time we need help with a roof and will gladly recommend you. I was really pleased with the job Eagle Roofing did, and the speed in which they finished. They did an excellent job cleaning up. Thank your men. Thanks to all!!!! Eagle Roofing was very professional to deal with, job was done as promised with no hidden costs or surprises and our roof looks terrific! Thank you for repairing my roof! I really appreciate your speedy response. Fairly priced bid, completion of job in a timely manner, complete cleanup above expectations! Extra personable staff. Eagle Roofing was able to alter work schedule according to our needs and around our preschool classes. Very fast response to emergency situations. Staff was so friendly and professional at all times. My roof looks great! Thank you very much for all of your help. The county program is wonderful. I thank you for helping me get the new roof I needed. God Bless You! S. Cohen credits Eagle Roofing & Roof Cleaning of Newark with a stellar performance in handling a job that some roofers were unwilling to touch because of the (Gild) hall’s complicated architectural history.